For those who wish to arrive on Friday and don't know what to do with yourselves - hit this party for light refreshments - yeah, that means not a whole dinner! Join us for pizza, drinks and lots of good reminiscing -- 6:30 p.m. at the Wheaton Bowl -- Bowling is Optional! And still more - Don't forget it's homecoming weekend - so for those who really need an entire weekend of fun and frivolity - there's always the annual parade down whatever street - and of course who could not forget the tour of Glenbard followed by the football game. 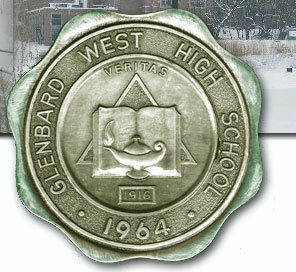 We've gotten quite a few inquiries about a 45 year reunion for the Glenbard West Class of 64. As the committee approaches Social Security age, like the rest of you, we're not up to a full blown, weekend long mind blowing extravaganza any more. We are willing to put together a somewhat more dignified effort that could involve library tours or a visit to a venue more in keeping with our stage of life. No, I can't even type that without laughing. What we really are thinking about is a less structured, less expensive weekend, coinciding with Glenbard West's Homecoming, September 25-26th. If you have an interest in coming to Glen Ellyn for a day or two, we'll put together a party worthy of the Class of '64. So let us hear from you soon. It's not a commitment to come, that'll come a little later. If there's something you want to do or someplace you want to visit as a group, let us know and we'll see if we can put it together. Keep in mind that Don & Angie's is gone, as is Bobby Rivers, Taubers Deli and pretty much everything else except Glenbard, The Glen Theater and McChesney & Millers. Get back to us as soon as possible and we'll see if we can't pull this off.